UPDATED: Tue., Aug. 7, 2018, 11:04 p.m. Candidates with bolded names will advance to the November election. Democrats may once again have a chance to win seats in Spokane County’s 6th Legislative District. The district, which covers the West Plains and western Spokane, hasn’t elected a Democrat since 2008. But in all three races in the 6th on Tuesday’s primary ballot, Democrats won more votes than Republicans. 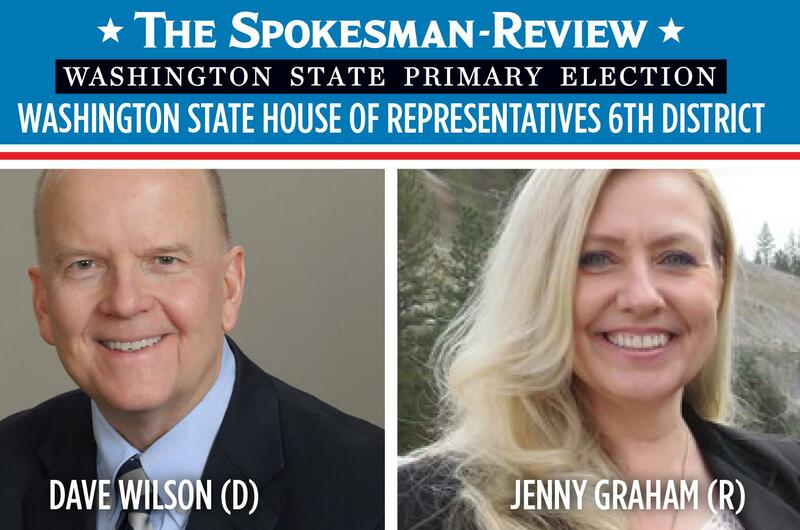 In the race for House Position 2, Democrat Dave Wilson and Republican Jenny Graham will continue to the general election, with Wilson taking 42.7 percent of the vote and Graham claiming 30.5 percent. Wilson, a moderate Democrat, ran for Congress as an independent in 2014 and 2016 before choosing to run as a Democrat for the position 2 race. A longtime resident and former business owner, Wilson has said he wants to improve health care access, provide better education for K-12 and make college more affordable. Wilson said he was “humbled,” and doesn’t take the lead for granted. The election results reflect his campaign messages resonating with voters, Wilson said. Republican Jenny Graham, another longtime resident and business owner, has garnered support from several current and former Republican legislators, including Jeff Holy and John Ahern. She worked with both legislators in 2013 to help craft a bill that increased the statute of limitations for child sexual predators. Her campaign has focused heavily on public safety and working with small business owners. She said she wants to create more “good-paying, blue-collar jobs” and help small businesses succeed. Graham said she wants to be an advocate for constituents that feel under-represented in Olympia. Republican John Aiken came in third at 15.4 percent, and Democrat Rion Ametu fourth at 11.2. Published: Aug. 7, 2018, 9:01 p.m. Updated: Aug. 7, 2018, 11:04 p.m.